Under the Revolution and Napoleon. In medieval times capital of Guienne; to-day, of the department of La Gironde, France. It derives its name from Bourdelois, the district in which it is situated. According to a legend, the Jews settled at Bordeaux shortly after the destruction of the Second Temple, and it is also said that a considerable number of them settled there in the sixth and seventh centuries, because of the commercial advantages of the city. Under Louis le Débonnaire they were allowed to trade freely (828). They had their own administrative and judicial systems and officials. The slave traffic, however, in which many Jews were concerned, was interdicted by royal decree in 829; and from this period the baptismal records contain no entries of conversions to Christianity made among the slaves of the Jews. In 848 the Jews were accused of having delivered Bordeaux to the Normans to be pillaged and destroyed. The Normans were said to have entered the city by means of the "Rue Juifve," a street which was not in the Jewish quarter. Again the bigoted populace opposed the Jews, and accused them of appealing to the Saracens for the purpose of laying waste the cities and lands of the south. There is no proof to sustain either of these charges. The first definite evidence of Jews in Bordeaux is found in a deed of 1077, where mention is made of the "Montemque Judaïcum," residence of the Jews in the suburb of Saint-Seurin, with the church of Saint Martin as center. There was also a "Porta Judaïca," a "Rue du Petit Judas," or "Puits des Juifs," and a "Rue Judaïque," the last still existing. The dwellings of the Jews were extra muros at this period. A chronicle of the year 1273 mentions them as continuing their residence in Saint-Seurin. "Rue Caphernam" was then the main street in the Jewish quarter. In this early period the Jews enjoyed comparative freedom, though the practise of usury was on several occasions (1214, 1219) forbidden. The city of Bordeaux was under English (Angevin) dominion; hence the decree of expulsion promulgated by the king of France in 1082, and the permission accorded Christians to repudiate debts due to the Jewish merchants (1182), did not affect the Jews of Bordeaux. Certain taxes were imposed. Thus, about 1150 the Jews paid the archbishop of Bordeaux a poll-tax of eight livres, being considered an estate in mortmain. The English kings sought to confirm the Jews in their ancient privileges; but the persecutions instituted by royal agents were indeed cruel. Plan of the Northwest Section of the City of Bordeaux, About 1450, Showing the "Rua Judaica" and the Jewish Quarters Outside the City Walls. Persecution of the Jews was interdicted by Edward I. of England May 23, 1275, but broke out anew under Edward II. The repressive measures of Philip Augustus of France (1198) had, of course, no application to the Jews of Bordeaux. It is claimed that the persecutions attempted in 1316 and 1318 aroused the Pastouraux, who committed outrages all over southern France and northern Spain. Edward III. granted the Jews complete freedom of travel and trade in the beginning of his reign. Several Jewish merchants, however, were banished at this time owing to the jealousy and hatred displayed by Christian merchants toward their Jewish competitors. The Jewish community was recognized as such and had been incorporated as "Communitas JudæorumVasconiæ." When the edict of Charles VI. was promulgated (Sept. 17, 1394), expelling all Jews from France, the Bordelais were not yet under French dominion; and when these came within the purview of Charles VII. 's enactments (1454), their position remained unchanged, although the Jews completely lost their identity as such. They were legally accepted as residents of Bordeaux, but not as Jews. Louis XI. (1462), recognizing the value of Jewish enterprise, but disregarding what was an open violation of the decree of expulsion, ameliorated the condition of the Jewish merchants. When the Jews were banished from Spain (1492) and Portugal (1496), the Jewish population at Bordeaux increased, for the refugees fled to the cities of southern France. No taxes had been paid by Jews as foreigners for some years, by virtue of their position as "Christian" residents. They continued to reside at Saint-Seurin, and the cemetery was known from early times as "Plantey deus Judius." The Maranos, or New Christians, who came at various times from the Iberian peninsula (1496 to 1525), did not, as at Amsterdam, discard the forms of Christianity at once and return to Judaism. Ancient statutes and more recent decrees forced the Portuguese Jews of Bordeaux into an anomalous position. As strangers, they had the right to settle and reside in the city. They lived as Christians, were baptized, married, and buried in accordance with the rites of the Catholic Church, and were Jewish only within the four walls of their homes. Among the Jewish families ("Portuguese merchants," as they were officially designated) who settled at Bordeaux at this time were those of Granolhas, Ram, Tarrégua, Milanges, Lisana, and Lopès, or Louppes. As physicians, lawyers, and scholars these settlers exerted such an influence on the life of the community that the "jurats" and Parliament advocated enrolling them as residents and often defended them from attack. They also influenced French life and letters; the mother of the celebrated Michel de Montaigne was a member of the Lopès family. From the beginning of the sixteenth century the Jews of Bordeaux were in reality a Marano community, the leaders of which were the members of the Govea family, so often mentioned in the annals of the city. Until the middle of the century the existence of the colony was dependent on the king's will. The letters patent granted by Henry II. of France Aug., 1550, established the community on a firm basis. The Portuguese of Bordeaux, called "New Christians," were given rights of residence and naturalization, of property and traffic, in line with similar grants to other foreigners in the kingdom. In this connection the rich and learned Goveas rendered eminent services to their coreligionists. However, the Maranos aroused the envy of the Christians, and the populace treated them as secret Jews ("Juifs déguisés"), threatening to procure the withdrawal of their privileges and to have them banished from France. Despite these manifestations of ill will, the Maranos secured, Nov. 12, 1574, a confirmation of the privileges of 1550 from Henry III. This decree, registered April 19, 1580, was procured through the instrumentality of the Marano merchants Diego Mendes Dias and Simon (Meïr) Lameira. Notwithstanding these safeguards, the Parliament of Bordeaux often came to the assistance of the Maranos, who were accused of Judaizing, to prevent their trading ventures from being restricted and their privileges from being curtailed. At the beginning of the sixteenth century the well-known Gradis family came to Bordeaux, and within one hundred years from that time the Marano community comprised fifty to sixty families. The merchants, however, continued to molest the Jews, and in 1604 the earlier letters patent were again confirmed and royal protection of Jewish rights and liberties (i.e., of the Spanish and Portuguese settled at Bordeaux) decreed. This measure proved to be of no avail, and by chance only did the Jews at Bordeaux escape the effects of the decree of expulsion of Louis XIII. (May 23, 1615), ordering all Jews to leave France within one month. The Bordelais Parliament came to the rescue of the Jews in 1625, when an embargo had been laid on all vessels in port. The Jews of this period enjoyed not only the protection of the Parliament and "jurats," but the favor of the queen, whose Italian physician, De Montalte, was professedly a Jew and interested particularly in the welfare of the Maranos at Bordeaux. On Dec. 4, 1636, a census was taken at Bordeaux, which enumerated 36 families and 167 individuals, together with 93 paupers, resident in the Portuguese community and "faithful Catholics at the time." Of the heads of families five had been born in France and six naturalized. By an order of the council, Aug. 9, 1662, many of these were admitted to full rights as citizens of Bordeaux. The most prominent Portuguese families were those of Alvares, Cardozo, De Cisneros, Da Costa, Dias, Lacoste-Furtado, Lopès, Machado, Mendes, De Moura, Oliveira, and Sasportas. In 1675, in consequence of the hatred of the other merchants, the Portuguese sought to leave Bordeaux, and Nov. 20, 1684, many poor Jews (comprising twenty-one families, the Lombresso, Campos, and Monsanto, among others) were expelled from Bordeaux on the ground of treason to the king. This decree was annulled Jan. 11, 1686, and from that date the French government tacitly accepted the Jews as residents of Bordeaux. The Jews of Bordeaux could not avoid paying the tax levied by the government of Louis XIV., and hence from 1686 were recognized as Jews. In 1656 there was one family of professing Jews there; in 1666, two; in 1676, nine; and in 1686, seventeen. They continued to live outwardly as Catholics. In 1710 the Jews were interred in the cemetery of the Franciscans. Although numbering one hundred families, they had no public synagogues. The baptism of Jewish children ceased in 1727, as the rabbis openly performed the rite of circumcision, celebrated the Jewish festivals, etc. After 1730, the Jews were not considered as "New Christians," but were permitted to live openly as Jews, to own their cemetery,and to proselytize. In 1734 there were about 350 Jewish (Portuguese and Avignonese) families at Bordeaux, numbering nearly two thousand individuals. In 1731 David Gradis had been made a citizen. Louis XV. granted the Jews new letters patent (June, 1723), and shortly thereafter seven synagogues existed (the public, the Avignonese, and five private; e.g., those of the Gradis and the Peixotto). Many of the Jews, however, were converted to Christianity, and whenever privileges were granted, a heavy tax had to be paid. On various occasions the patriotic Jews lent large sums to the city. About 1735 Falcon and Attias were rabbis of the community. 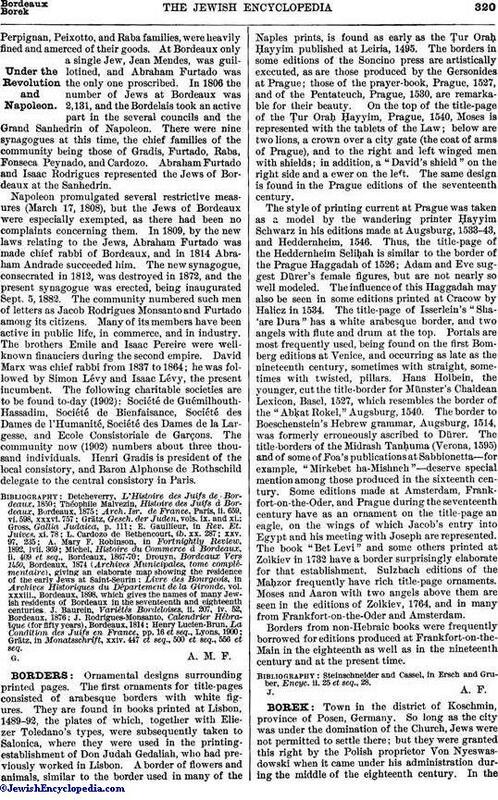 Jews from Avignon had settled at Bordeaux as early as 1722. The letters patent of 1723 did not apply to them, and the Portuguese Jews looked upon the Avignonese as enemies whom they accordingly felt bound to suppress. They procured a decree of expulsion from the king in 1734, ordering the Jews of Avignon to leave the city within three days. Many procured a respite and were permitted to return. Certain occupations were closed to them; their position and commerce were regulated by enactments in 1739, 1740, and 1749, and the Dalpuget, Astruc, and Lange families were granted rights of residence. In 1752 another census of the Jews of Bordeaux showed that 1,598 Portuguese Jews (327 families with 5 Jewish servants and 147 Catholic servants) and 348 Avignonese Jews (81 families with 11 Catholic servants) had settled there. The Jews from Avignon were simply "tolerated." The Portuguese Jews taxed all the Bordeaux wines used in the ritual, and, in order to extend the sale of wines, established many agencies in foreign cities. In Germany this tax was strenuously resisted, and in 1751 Rabbi Jonathan Eybeschütz, who had come to Hamburg from Metz in 1750, declared the Bordeaux "kosher" wines to be ritually impure. The tax had amounted to four francs per barrel; in consequence of the rabbi's opinion this very profitable source of revenue to the Jews of Bordeaux was cut off, much bitter feeling between Germans and Portuguese was engendered, and the foreign agencies were discontinued. Meanwhile the trouble with the Jews from Avignon continued, and the various measures adopted by them to secure their rights and to regulate their commerce were opposed by the Portuguese Jews. 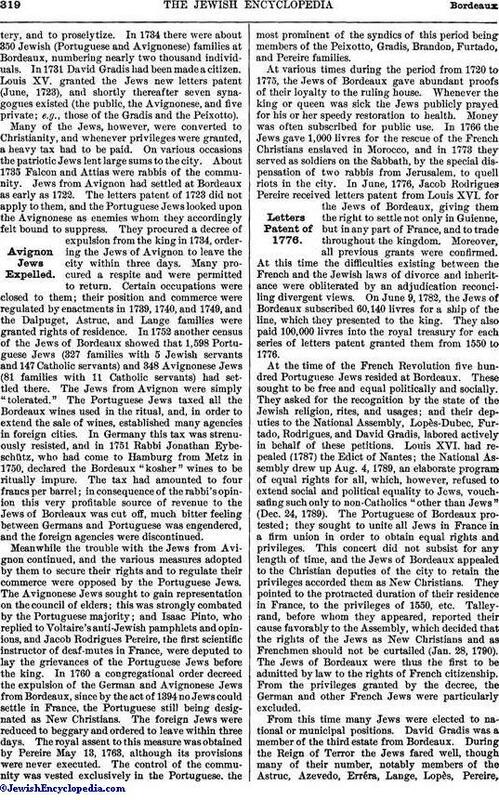 The Avignonese Jews sought to gain representation on the council of elders; this was strongly combated by the Portuguese majority; and Isaac Pinto, who replied to Voltaire's anti-Jewish pamphlets and opinions, and Jacob Rodrigues Pereire, the first scientific instructor of deaf-mutes in France, were deputed to lay the grievances of the Portuguese Jews before the king. In 1760 a congregational order decreed the expulsion of the German and Avignonese Jews from Bordeaux, since by the act of 1394 no Jews could settle in France, the Portuguese still being designated as New Christians. The foreign Jews were reduced to beggary and ordered to leave within three days. The royal assent to this measure was obtained by Pereire May 13, 1763, although its provisions were never executed. The control of the community was vested exclusively in the Portuguese, the most prominent of the syndics of this period being members of the Peixotto, Gradis, Brandon, Furtado, and Pereire families. At various times during the period from 1720 to 1775, the Jews of Bordeaux gave abundant proofs of their loyalty to the ruling house. Whenever the king or queen was sick the Jews publicly prayed for his or her speedy restoration to health. Money was often subscribed for public use. In 1766 the Jews gave 1,000 livres for the rescue of the French Christians enslaved in Morocco, and in 1773 they served as soldiers on the Sabbath, by the special dispensation of two rabbis from Jerusalem, to quell riots in the city. In June, 1776, Jacob Rodrigues Pereire received letters patent from Louis XVI. for the Jews of Bordeaux, giving them the right to settle not only in Guienne, but in any part of France, and to trade throughout the kingdom. Moreover, all previous grants were confirmed. At this time the difficulties existing between the French and the Jewish laws of divorce and inheritance were obliterated by an adjudication reconciling divergent views. 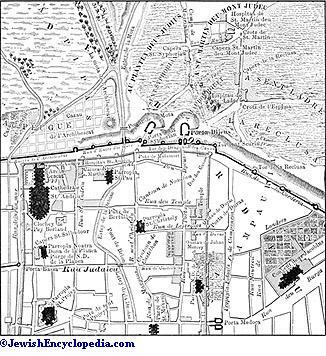 On June 9, 1782, the Jews of Bordeaux subscribed 60,140 livres for a ship of the line, which they presented to the king. They also paid 100,000 livres into the royal treasury for each series of letters patent granted them from 1550 to 1776. At the time of the French Revolution five hundred Portuguese Jews resided at Bordeaux. These sought to be free and equal politically and socially. They asked for the recognition by the state of the Jewish religion, rites, and usages; and their deputies to the National Assembly, Lopès-Dubec, Furtado, Rodrigues, and David Gradis, labored actively in behalf of these petitions. Louis XVI. had repealed (1787) the Edict of Nantes; the National Assembly drew up Aug. 4, 1789, an elaborate program of equal rights for all, which, however, refused to extend social and political equality to Jews, vouch-safing such only to non-Catholics "other than Jews" (Dec. 24, 1789). The Portuguese of Bordeaux protested; they sought to unite all Jews in France in a firm union in order to obtain equal rights and privileges. This concert did not subsist for any length of time, and the Jews of Bordeaux appealed to the Christian deputies of the city to retain the privileges accorded them as New Christians. They pointed to the protracted duration of their residence in France, to the privileges of 1550, etc. Talley-rand, before whom they appeared, reported their cause favorably to the Assembly, which decided that the rights of the Jews as New Christians and as Frenchmen should not be curtailed (Jan. 28, 1790). 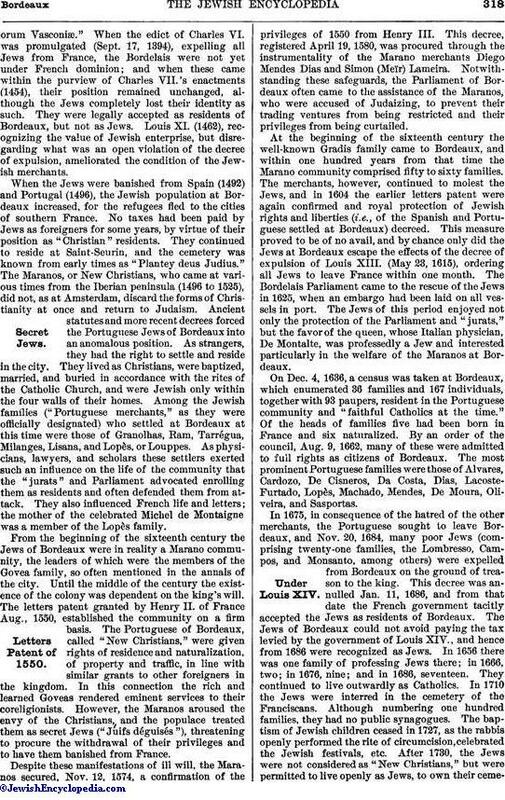 The Jews of Bordeaux were thus the first to be admitted by law to the rights of French citizenship. From the privileges granted by the decree, the German and other French Jews were particularly excluded. From this time many Jews were elected to national or municipal positions. David Gradis was a. member of the third estate from Bordeaux. During the Reign of Terror the Jews fared well, though many of their number, notably members of the Astruc, Azevedo, Erréra, Lange, Lopès, Pereire,Perpignan, Peixotto, and Raba families, were heavily fined and amerced of their goods. At Bordeaux only a single Jew, Jean Mendes, was guillotined, and Abraham Furtado was the only one proscribed. 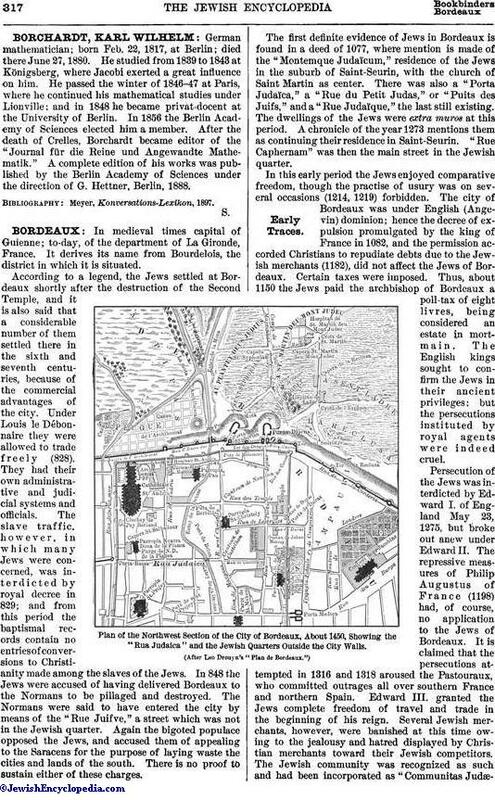 In 1806 the number of Jews at Bordeaux was 2,131, and the Bordelais took an active part in the several councils and the Grand Sanhedrin of Napoleon. There were nine synagogues at this time, the chief families of the community being those of Gradis, Furtado, Raba, Fonseca, Peynado, and Cardozo. Abraham Furtado and Isaac Rodrigues represented the Jews of Bordeaux at the Sanhedrin. Napoleon promulgated several restrictive measures (March 17, 1808), but the Jews of Bordeaux were especially exempted, as there had been no complaints concerning them. In 1809, by the new laws relating to the Jews, Abraham Furtado was made chief rabbi of Bordeaux, and in 1814 Abraham Andrade succeeded him. The new synagogue, consecrated in 1812, was destroyed in 1872, and the present synagogue was erected, being inaugurated Sept. 5, 1882. The community numbered such men of letters as Jacob Rodrigues Monsanto and Furtado among its citizens. Many of its members have been active in public life, in commerce, and in industry. The brothers Emile and Isaac Pereire were well-known financiers during the second empire. David Marx was chief rabbi from 1837 to 1864; he was followed by Simon Lévy and Isaac Lévy, the present incumbent. The following charitable societies are to be found to-day (1902): Société de Guémilhouth-Hassadim, Société de Bienfaisance, Société des Dames de l'Humanité, Société des Dames de la Largesse, and Ecole Consistoriale de Garçons. The community now (1902) numbers about three thousand individuals. Henri Gradis is president of the local consistory, and Baron Alphonse de Rothschild delegate to the central consistory in Paris. Grätz, in Monatsschrift, xxiv. 447 et seq., 500 et seq., 556 et seq.